The “Award winning” cozy and relaxing Applesauce Inn Bed and Breakfast is just a stone’s throw from Torch Lake, the 3rd most beautiful lake in the world! We are minutes away from all your favorite outdoor activities like skiing or snowboarding at Shanty Creek or snowshoeing the hiking trails of the Grass River Natural Area and the new Glacier Hills Pathway and Natural area in Bellaire. (How about dog sledding…check out Russ-Stick Acres in Mancelona.) We are only a 1/2 hour from Traverse City, the Leelanau and Old Mission Wineries and an hour and a half either way from Sleeping Bear Dunes or Mackinac Island. 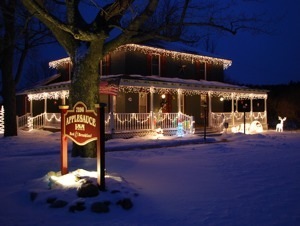 Applesauce Inn’s commitment is that you will be comfortable here, you will feel like family, and you will leave relaxed and making plans to return!